Theodore Roosevelt Malloch, author of the new “Davos, Aspen, and Yale: My Life Behind the Elite Curtain as a Global Sherpa,” and who is professor of Management Practice at the Said Business School at Oxford, said Putin is calculating for the future much the same as Gorbachev calculated in 1982, when officials in the Soviet Union feared a Ronald Reagan victory over Jimmy Carter could spell trouble for the Kremlin. Malloch has set up international conferences, held a United Nations post, mingled with the top players in Washington and lists multiple foundation board memberships on his resume. He held senior policy positions at the U.S. Senate Committee on Foreign Relations and the U.S. State Department, and currently advises numerous international and U.S. governmental bodies and think tanks. For example, he pointed out the capitulation of the Obama Administration over placing a missile defense shield in the Czech Republic and Poland in the first term, and to the Obama administration’s decision to send weapons to support anti-Russian forces in Ukraine during Obama’s second term. He contrasted this to Reagan’s determination in his first term to bring down the Soviet Union by spending for missile defense and Reagan’s decision in his second term to supply U.S.-built Stinger shoulder-fired surface-to-air missiles to the mujahedeen fighting against the Soviets in Afghanistan. “Today, the same economics are in play, such that Donald Trump in the White House would need no weapon greater than the price of oil to bring Putin to his knees,” Malloch stressed, completing the comparison. Trump is leading, by a significant margin, the race for the GOP nomination for president, having won in New Hampshire, South Carolina and Nevada. Hillary Clinton continued to lead for the Democratic nomination, although she’s facing tough competition from Bernie Sanders. Malloch insists that today a President Trump would have a much easier time using oil as an economic weapon against Putin. In 1982, Reagan had to enlist the Saudis to increase oil production to lower the price of oil. Today, the United States has once again been restored to a top position as a world leader in crude oil production and the surge in shale oil production already has caused a reduction in the price of oil on world markets to the point where Russia is increasingly under economic distress. Malloch mused what a Kremlin adviser might today be calculating, anticipating the need to make gains while Obama still is in office, fearing a President Trump would be willing to stand up to the former KGB chief like no one else. “In Europe, Putin can be expected to continue a policy of testing NATO by resorting to what in Russia are known as ‘Maskirovka tactics’ of military deception where, for instance, Russia continues to support with weapons and ground forces the pro-separatist factions in Ukraine, while denying Russia is waging a war to expand Russian dominance of Crimea to Ukraine. 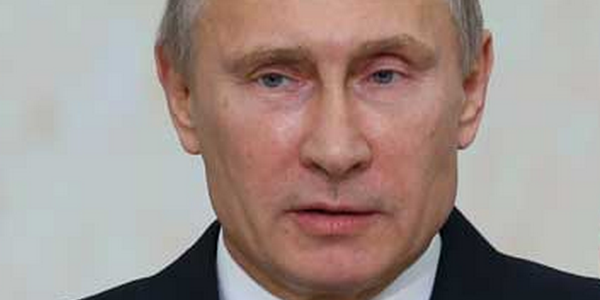 “Anticipating that President Obama will continue to do nothing, Putin should press ahead in Ukraine,” Malloch argued. He said Putin can safely calculate that if the separatist forces win in Ukraine, a Trump White House will find it much harder, if not impossible, to drive Russia from either Crimea or Ukraine. If Hillary wins, Russian gains in Ukraine would remain unchallenged, Malloch noted. In the Middle East, another region where Russia has gained in influence during the Obama administration, Malloch argued that Putin would be well advised to continue the bombing in Syria in support of Assad, while pushing Turkey’s President Erdogan into a clash with the Kurds, hoping to cause conflict within NATO. “Russia since before World War I has had nationalistic interests in maintaining a dominant position in the Middle East,” Malloch pointed out. “Now following the disastrous one-sided deal Secretary of State John Kerry negotiated with Iran, Russia’s position with Iran has never been stronger,” Malloch analyzed. Malloch argued Putin is winning in the Middle East, as Russian-backed Shi’ites have the opportunity for the first time in history to gain a dominant military and political advantage over Saudi Arabia and Sunni Muslims throughout the region. Parenthetically, Malloch noted, Trump should start pointing out that under Reagan, Iraq under Saddam Hussein won the 1980 to 1988 war against Iran. But under Obama, the United States has largely pulled out of Iraq, allowing the Iranian Revolutionary Guard to fill the vacuum and take control of large sections of Iraq simply by joining with what remains of the Shi’ite-dominated Iraqi military to fight Isis. Malloch pointed to recent news reports that three Baltic states are now fearful they are the next targets of Russian aggression following invasions in Georgia in 2008 and in Crimea and eastern Ukraine in 2015, with Lithuania – Moscow’s biggest obstacle to building a land bridge between Kaliningrad and the rest of Russia – having the greatest reason for concern. “Putin is already bragging that Russia could take the Baltic States in 24 hours, just as the Soviets did with a military invasion in 1941,” Malloch pointed out. “The Obama administration again would do predictably nothing, and a Russian invasion of the Baltics before the November election in the United States could present a Donald Trump White House with a fait accompli that would be hard for the U.S. to reverse,” he said.